Ottawa Fashion Week is a platform for National and international designers to showcase their work and talent. OFW has become an avenue of expression, creativity, and innovation and it is also a means of uniting the community in their appreciation of the latest trends in design and art. Showcasing an array of unique designers, their spring/summer creations will be displayed through individual runway shows with about 7 designers per night. The city of Ottawa is filled with style conscious individuals who continually seek innovative ways to experience fashion. Each season, designers taking part in OFW meet this demand by presenting designs that combine sophistication with creativity. In between shows, the front stage lounge is the place to be! This complimentary area, which is open to the public, includes everything from live entertainment, to local jewelry and clothing designers, to beauty touch-ups, and a number of photo booths. Find tickets to shows for your favorite designers on Ottawa Festivals website and keep up with all the upcoming activities on Ottawa Fashion Week. Looking for something to do this weekend? Check out Harvest Noir Ottawa's secret pop-up picnic + vintage fashion + dj dance party. It's the ultimate end-of-summer party and start-of-harvest ball. With a “chic” picnic, fashion show, DJ dance party which features TIMEKODE, and several flashmobs, Harvest Noir is a harvest feast for all the senses. Groups of friends of all ages dress in black, celebrate local food and fine wine at the picnic, and then dance the night away in one of Ottawa's finest venues. HN2012 was Canada's 2nd-largest chic picnic, with 1,500 guests picnicking at City Hall and dancing at the National Arts Centre. At the last minute, the location is revealed to the guest list. Elegantly-dressed diners head to the secret destination toting picnic baskets stuffed with locally-harvested food they've prepared, set up a feast at their assigned tables, and celebrate the end of summer and start of the harvest with friends old and new. Your invited to the STARFISH: creative events + inspiration Clothes Swap Party. 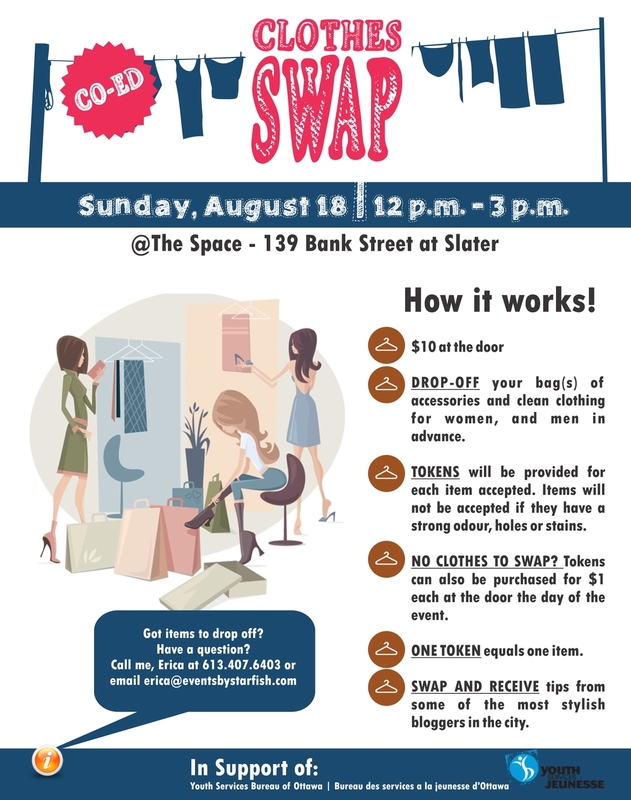 This August 18th 2013, @The Space will be holding another amazing clothes swap just for you. So clean out your closet, invite everyone you know (especially those you know you want clothes from) and get ready to swap your clothes for a good cause! SHARE THE LOVE! 1. Admission to the Clothes Swap is $10, payable at the door. Event begins at 12 noon At the Space, 139 Bank Street, Suite 200 (next to Quiznos on Bank Street at Slater). Email Erica@eventsbystarfish.com to arrange alternate times. 3. Tokens will be provided for each item accepted. Items will not be accepted if they have a strong odour, holes, and stains. 4. No clothes to swap? That’s ok! You can still come and shop. Tokens can be purchased for $1 each at the door the day of the event (plus admission). 5. One token equals one item. 6. Swap and receive tips from some of the most stylish bloggers in the city. 7. Fill out the donation form below and include it with your clothes swap donations. This event proudly supports the Youth Services Bureau of Ottawa (YSB). Clothing and accessories that remain after event will be donated to YSB for their men and women shelters. This Saturday, August 10th, 2013 Urban Ocean will be offering SUP starting at 9:30am in Manotick and donating the proceeds to the Ottawa Humane Society. These socials are open to first timers and experienced paddlers alike, if you have never paddled with Urban Ocean before consider this your SUP 101, we will go over the basics so everyone has a safe and enjoyable experience. After the paddle stick around, Hurst Marina has opened up their facilities to all participants to use their pool and hot tub for the day. Let's get out on the water and raise some money in memory of a Cat that showed the world it's good to get your paws wet! To register and find more information please click here. If your unable to attend and still wish to donate click here.